Then I was checking my facebook page and there was the word again in a link from GTD Guru David Allen. In my experience the universe gets annoyed when you don’t pay attention to it so this is me listening to the cosmos. My fear of this word is twofold; I have completion hooked up with endings in my head and I don’t want endings in my life, I want the completion to lead into new challenges and new levels of my journey. The other fear is the fear that when something is done I will look back on it and be unhappy. My work is currently all snippets of art, 1 leaf in a sketchbook, 1 sketchbook on etsy, I don’t create to completion. So one of my first implementations of the word will be to go through all the UFO’s (unfinished objects) in the studio and determine whether to discard or complete them. I would like to work on a larger scale than my sketchbooks creating pieces of art that stand alone and are suitable to hang, gift or perhaps even enter in a competition! I would like to promote my sketchbooks to other artists. I have a feeling etsy may not be the best way to do this as I think quality work may just get lost in the crush. I’ll need to work out a plan of how to effectively promote the book side of things without taking away from the at side of things. Living this word in 2010 would see me posting wip’s and finished work to my blog and flickr. It would also see me tidying up some unfinished things around the house such as ebaying off some unwanted items, sorting the spare room, cataloging my seed collection, finding a new accountant. The Big dream art goal for this year would be 50 pieces of art. The Blog goal is 52 Weekly reviews. The CED2010 goal is to be creative EVERY day! Not to get sucked in by my major procrastination methods of internet & tidying up. Well it’s Day 1 of January 2010 here in the southern hemisphere ASO i’d better go get started! Well it’s time to draw the competition to win one of my handmade pocket sketchbooks! Thank you to everyone who commented your name was printed and placed into the draw along with an extra entry for those who promoted the competition! The first batch of books based on some of your suggestions are just being finished and should be in my new store on Artfire this week. I’ve babbled on long enough… let me just stir these entries up a bit! Congratulations Sherrie! and thank you again to everyone who entered. 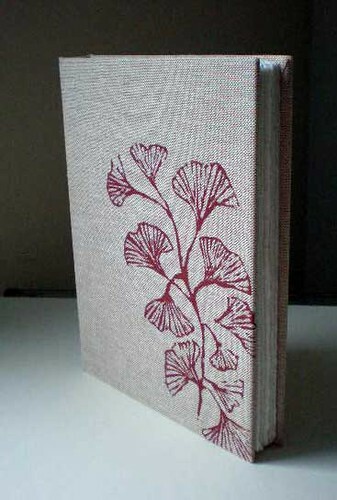 Recycled leather, kraft paper interior, interior of leather os printed with my hand carved block print . Get another chance to win! Thank you everyone for your entries – The competition is now closed – the Winner was Sherrie! Another chance to win a Handmade Sketchbook. I have received so many wonderful Comments on yesterday’s post – it’s so great to hear everyone’s likes, dislikes and wishes for the perfect sketchbook. In fact, the responses have been so good that I decided to give everyone an extra chance to win! Well last night I began sewing and have three book blocks completed, I wanted to take a photo but I left my camera cable at work… The style of binding for these first books is sewn onto tapes. 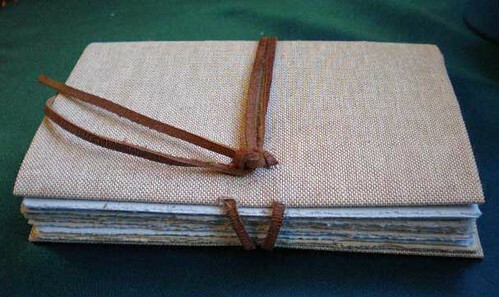 I find linen tape to be a durable but flexible Lay flat style of binding. And from your comment you all want your books to lay flat. I’m with you there I really can’t work in spiral books anymore! I also went and stocked up on some different colours of book cloth. More of the linen look above plus some sky blue, very very pale mint green, and a royal blue. Of course I’m stocked up on basic black and I have metres of burgundy from a previous project! Off to pottery class tonight so I will talk to you all again tomorrow! PPS. Don’t forget you can follow this blog by adding my rss feed to your reader. It’s a great way to stay tuned for more competitions. Competition & Sketchbooks – what do you look for? So Last night I was on a Binding Blitz and cut the paper for 7 new sketchbooks, 3 around pocket moleskine size, 3 about 18cm (7″) x 12.5cm (5″) and one 25cm (10″) x 18cm (7″). The papers are varied from arches 88 and bfk rives printmaking paper to saunders waterford and fabriano drawing papers. I’ve often been told I should sell my journals and sketchbooks but before I do I’m asking all the artists out there to tell me what they look for in a sketchbook. In return I will send one of my hand bound pocket journals to one lucky responder anywhere in the world. If you aren’t inclined to bind your own, what books do you buy and what draws you to them? Please excuse my blatant market research but what size books do you like? does the number of pages matter or are you drawn to a good book? And the big one – what do you pay for your sketchbooks? Don’t forget One lucky reader will receive a pocket sketcbook from me for answering my questions! Tell me what you look for in a sketchbook in the comments below – size? Price? Type of paper & cover? Make sure to leave an email address – I will draw the winner on Sunday 13th December at 8pm Australian eastern daylight time.